To date, supermarkets have only been able to keep products on their meat counters for a few days. But now researchers have developed an antimicrobial active packaging film that destroys the microorganisms on the product surface, thereby increasing the shelf life not only of fresh meat, but also of fish, cheese and other cold cuts. When it comes to quality, consumers make very high demands: They want ready-to-use, pre-portioned foods that will remain fresh and retain their attractive appearance for days. This is particularly true as regards meat and cold cuts. However, while freshly slaughtered meat is virtually sterile, it generally becomes contaminated with microorganisms - feces from hides and skins, germs on tools, hands or in rinsing water - during subsequent cutting and processing stages. Consequently, supermarket meat that initially looks very appetizing tends to change color, texture and even smell within a few days. These changes are caused by chemical, physical and microbiological processes, e.g. the formation of biogenic amines, which occur as microorganisms on the meat that breed and thrive. 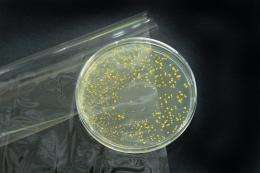 Around 20 different species of bacteria, yeasts and molds are known to play a part. Recently, antimicrobial active packaging has opened the door to the possibility of maintaining product quality and safety over a longer period of time. According to EU Regulation 450/2009, these types of material can extend the shelf life of packaged foods, and are permitted to incorporate components specifically designed to release substances into or onto the food in question. This kind of packaging has already been introduced in Japan, where silver, wasabi and ethanol are among the active ingredients used. Carolin Hauser, a food chemist at the Fraunhofer Institute for Process Engineering and Packaging IVV in Freising, Germany, has now developed and tested a new, lacquer-based antimicrobial active film which incorporates a controlled release mechanism. “That means that, on direct contact, an antimicrobial agent is released onto the product surface,” she explains. “The surface is the primary point of attack for germs. Using only the smallest quantities of active agent, the packaging thus provides effective protection for food.” Of course, only active agents that comply with the rules governing foodstuffs may be considered for use in these films; they must not be poisonous or allergenic, and must be neutral in terms of smell and taste. Furthermore, any active agent must be readily transferrable onto packaging film. Taking into account all these considerations, Hauser elected to use sorbic acid, which she dissolved in a lacquer and deposited on a base film.